filled with twists and terror. night of secrets, celebrities & scandal. Lights! Camera! MURDER! does not have a clean version. This party has all-female characters. Names and descriptions will vary slightly from the names and characters listed below. 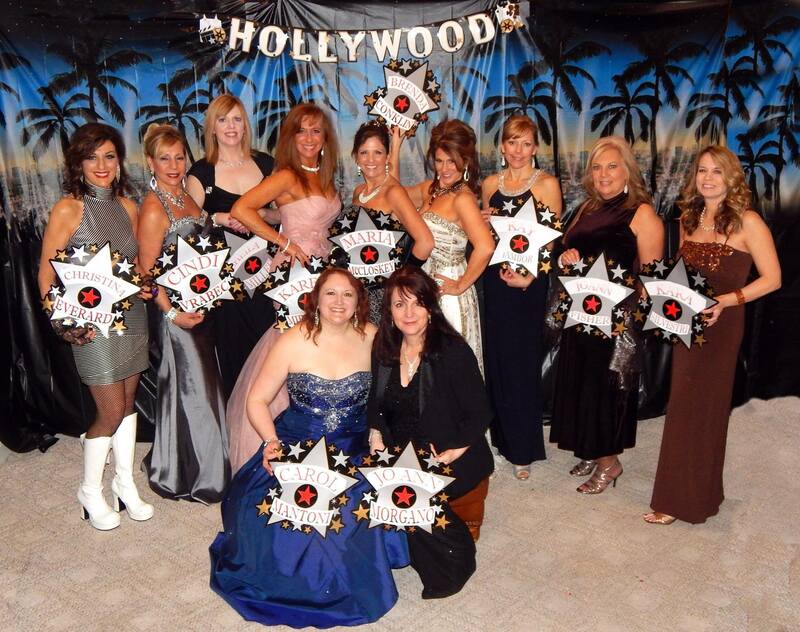 While Vanity's wealth can't buy them starpower, it can fund the most elaborate post-Oscar bash around. As the center of attention for the party, they will not let anyone steal the show. As a matriarch on the Hollywood scene, her award filled career does not include an Academy Award, even after 15 nominations. Will this be the year she changes that? This talented actress will do anything to get what she wants--whether it is an award, a leading role in a movie or the affection of a handsome actor. As the little sister to Angel, Steffi has lived in her shadow far too long and is certain that she will make a name for herself before the night is through! A top-notch actress who often gets second-rate treatment, Jada's engagement was disrupted by Angel Wood and now her acting career may be as well. Barbie Doll- Pop star and aspiring actress. Barbie's looks and her agent have gotten this aspiring actress far in life, but can they take her any further in Hollywood? The Who's Who and all the latest Hollywood gossip you need to know for your Lights! Camera! MURDER!!! party! 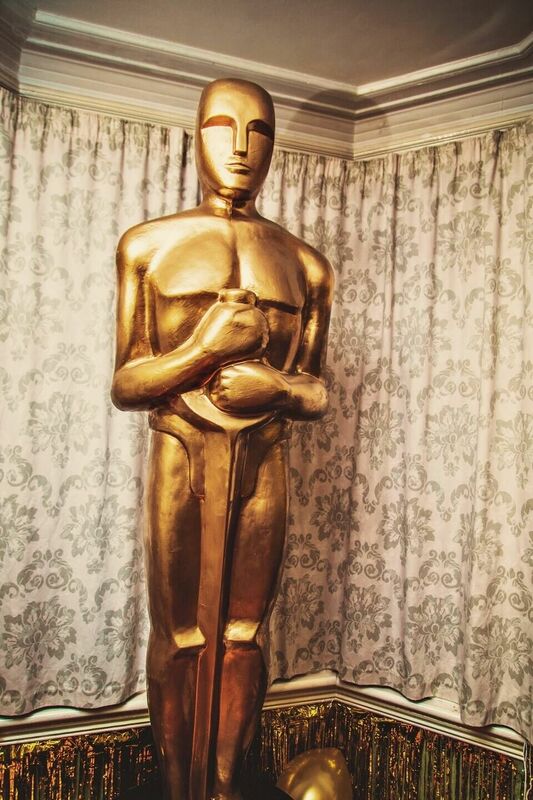 As the Oscars ends, the celebrities’ night has just begun! 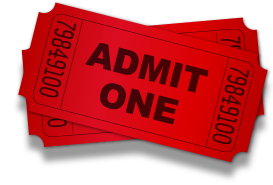 Find out who has a golden ticket to the hottest event…. Vanity Affair—Millionaire. 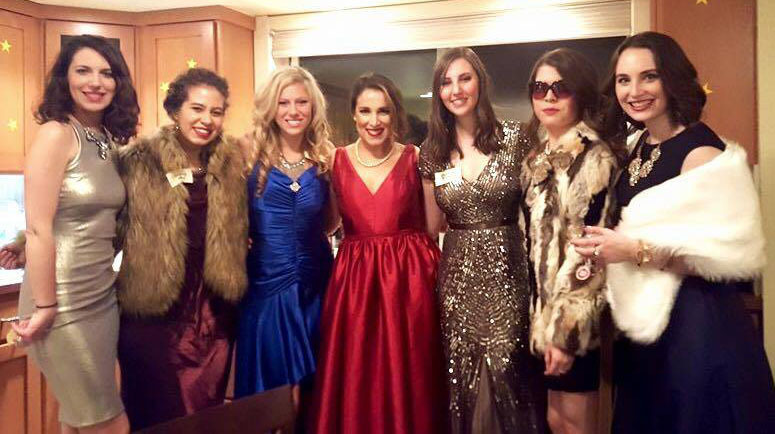 While Vanity’s wealth can’t buy them starpower, it can fund the most elaborate post-Oscar bash around. As the center of attention for the party, they will not let anyone steal the show. 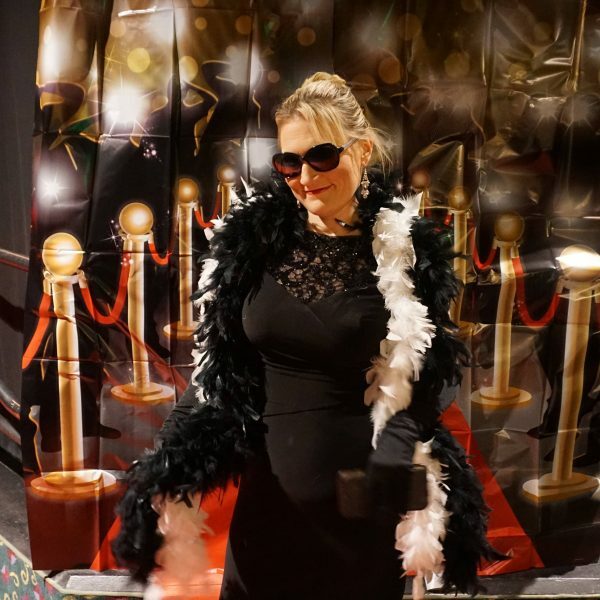 Dana Darling—Hollywood diva. As a matriarch on the Hollywood scene, her award filled career does not include an Academy Award, even after 15 nominations. Will this be the year she changes that? 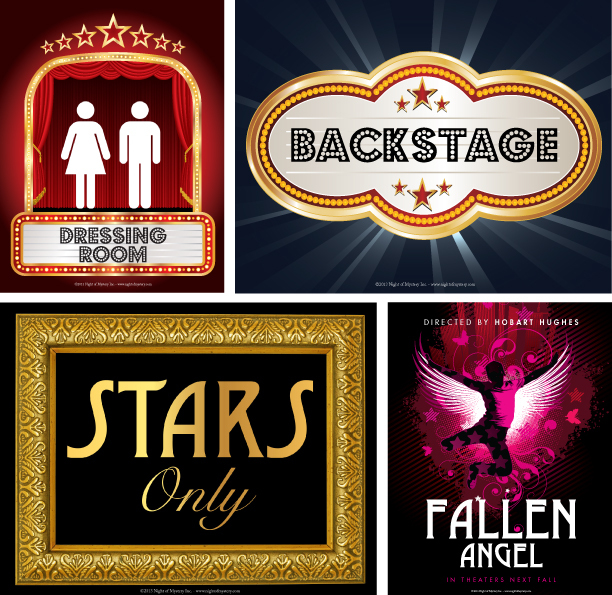 Angel Wood—Aspiring actress. This talented actress will do anything to get what she wants—whether it is an award, a leading role in a movie or the affection of a handsome actor. Steffi Wood—Actress. As the little sister to Angel, Steffi has lived in her shadow far too long and is certain that she will make a name for herself before the night is through! Jada Broken—Actress. A top-notch actress who often gets second-rate treatment, Jada’s engagement was disrupted by Angel Wood and now her acting career may be as well. Barbie Doll—Pop star and aspiring actress. Barbie’s looks and her agent have gotten this aspiring actress far in life, but can they take her any further in Hollywood? Natasha Gibson—Young actress. A favorite with the teen crowds, this young adult is serious about pursuing more mature acting roles…that is if nothing comes in her way. Lola Talent—Latin diva. Best known for her singing career, Lola extended her celebrity career to include acting, perfumes and a clothing line. Now, with her husband aspiring to gain the same recognition, she is 100% behind him… or is she? Mario Talent—Aspiring actor. As the husband of a diva, Mario has always done as he was told. Now that Mario is looking out for himself, his intentions may change. Hobart Hughes—Director. Known as the brightest director of all time, everyone is desperate to be cast in his upcoming movie, A Fallen Angel. But his decisions may depend on a lot more than an actor’s talent. Bobby Calling—Casting director. Frustrated by Hobart’s demands, Bobby is looking to cast the upcoming film, A Fallen Angel, as they see fit. Penelope Hughes—Director’s wife. It is no secret that Penelope loves her husband’s money more than the man himself. After many years of marriage, Penelope knows how to use her power in Hollywood to get what she wants. Princess Pop—Pop star. With Princess’ career on the verge of destruction, she is looking to reconstruct it any way she can. Brady Comeback—Pop star. With a reunion tour set to take place, this star is on the cusp of a comeback… or the last chapter of his career. 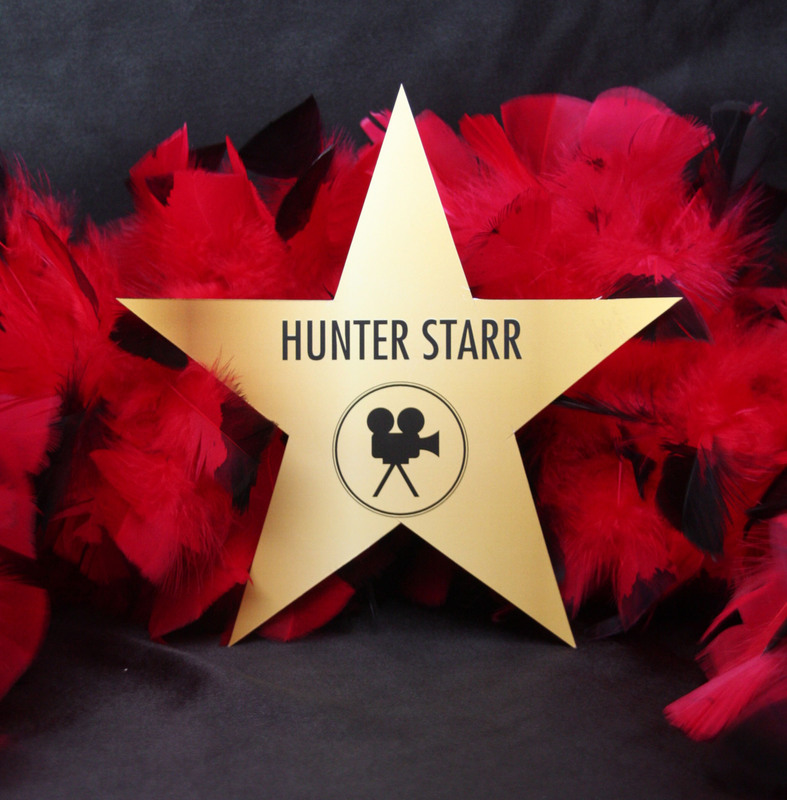 Hunter Starr—Pop star and aspiring actor. Since the Man 2 Man hiatus, Hunter has experienced much solo success in both his personal and professional life. While his band may want to relive the glory days, he is currently experiencing new heights on his own. Avery Scout—Talent representative. The “yes” person of Hollywood, Avery is responsible for launching some careers and sinking others. 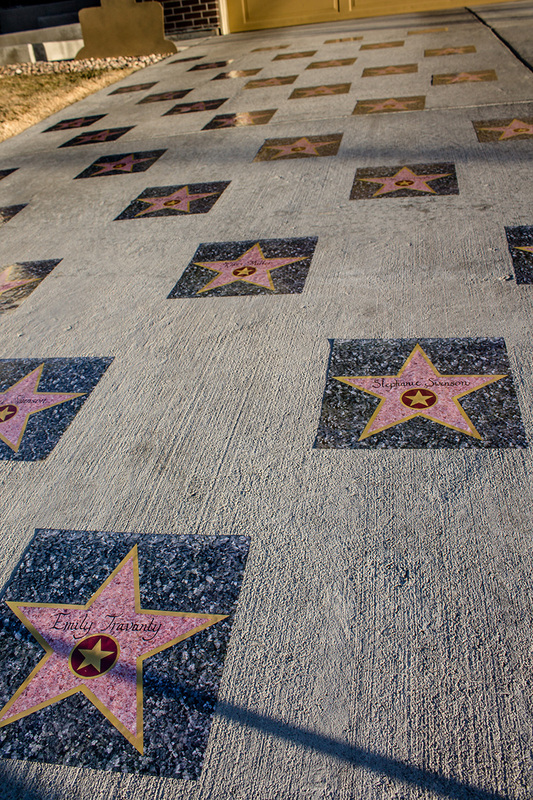 Hollywood is the center of America’s movie industry. It is part of the city of Los Angeles, in the western state of California. In eighteen-eighty-seven, a man named Harvey Wilcox decided to sell some farmland he owned near Los Angeles. He hoped builders would put up houses there. Harvey’s wife thought the name Hollywood would be nice for the new housing development. She liked the sound of the word, although no holly trees grow in California. At first, Hollywood was just a little town surrounded by orange trees and farms. But new technology would change it forever. Inventors in the United States and Europe had become interested in the idea of making pictures that moved. Thomas Edison’s company showed the first moving picture machine in eighteen-ninety-three. Two years later, the Lumiere brothers of France showed the first simple moving picture in Paris. American businessmen and artists hurried to explore the possibilities of the new technology. No one, however, suspected that movies would become the most popular kind of art in history. 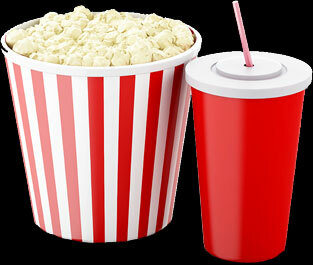 Soon, theaters around the United States began showing short movies. In nineteen-oh-nine, some of the largest American movie-making companies joined together. They legally stopped other companies from using the new technology. So, independent movie producers moved away from the Atlantic coast, the center of movie-making at that time. Independent movie producers wanted to go where eastern lawyers would not make trouble for them. They also wanted to go where there was warm weather and sunshine throughout the year. Hollywood was perfect. Director D. W. Griffith also arrived in Hollywood in those early years. He created new ways of using a camera to tell a story through moving pictures. Soon, the quiet community of farms and orange trees had changed. By the nineteen-twenties, Hollywood had become the movie capital of the world. 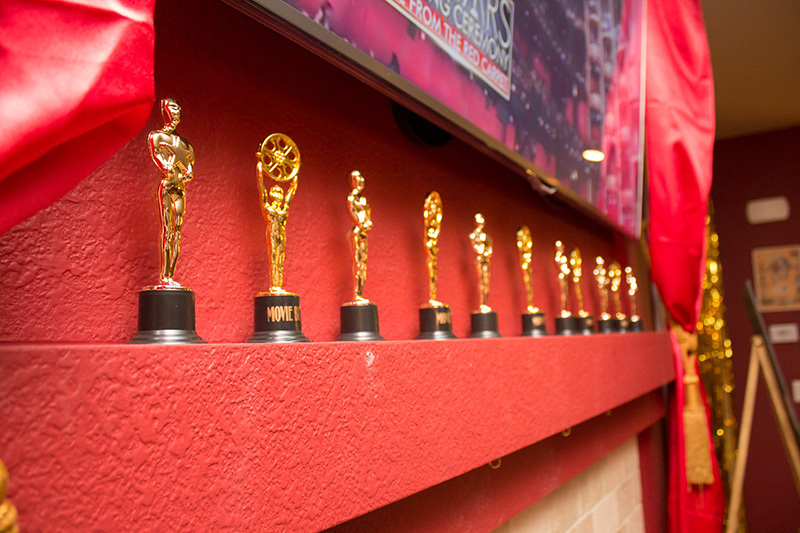 When the Academy Awards began, it announced the winners 3 months in advance the first year. After the anti-climactic show, the academy would announce the results at the show, only releasing the winners to the media to have them printed the night of the awards show at 11 p.m. This tradition continued for over a decade until the Los Angeles Times printed the winners ahead of time, thus ruining the surprise in 1940. 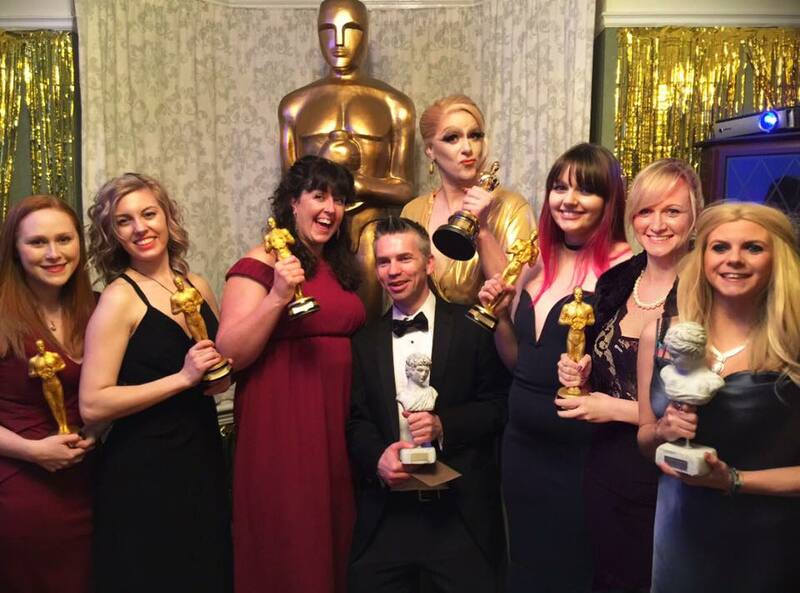 Since 1941, the winners have been known to only the Academy and are printed in a sealed envelope until it is opened onstage. 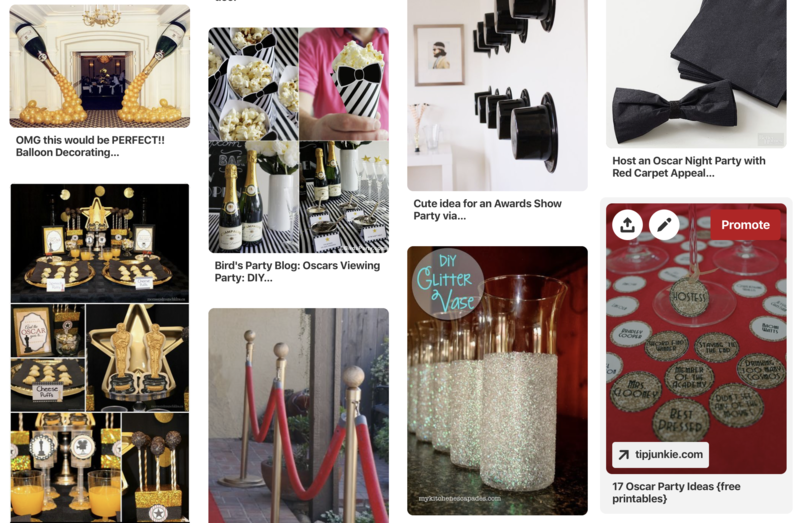 Look no further to get ideas, inspiration and more for your red carpet apparel! 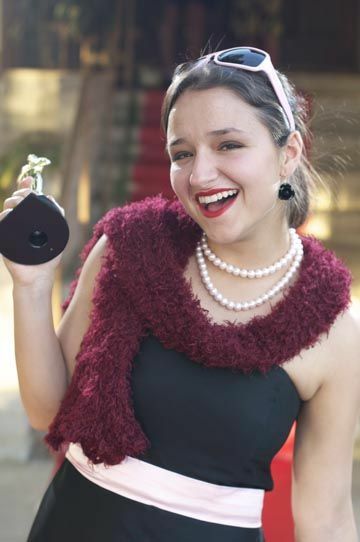 Make the perfect red carpet outfit! Click below for steps on how to create your perfect hairstyle for your perfect pageant hair! 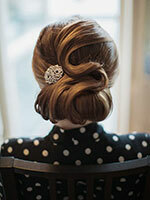 FOR MORE IDEAS on the perfect hair, see this link. From drab to GLAM! 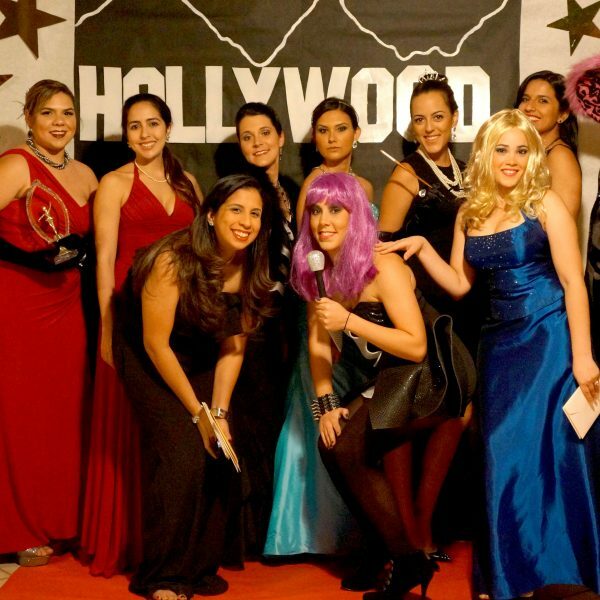 Look here to find out how you can dress up your party space to make it Hollywood worthy!!! • Create the famed “HOLLYWOOD” sign in your yard. 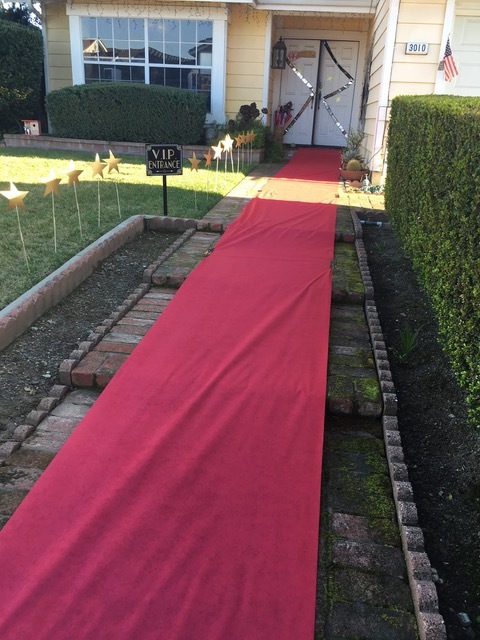 • Have a red carpet walkway to the entrance of your party! You can order a red carpet online here. 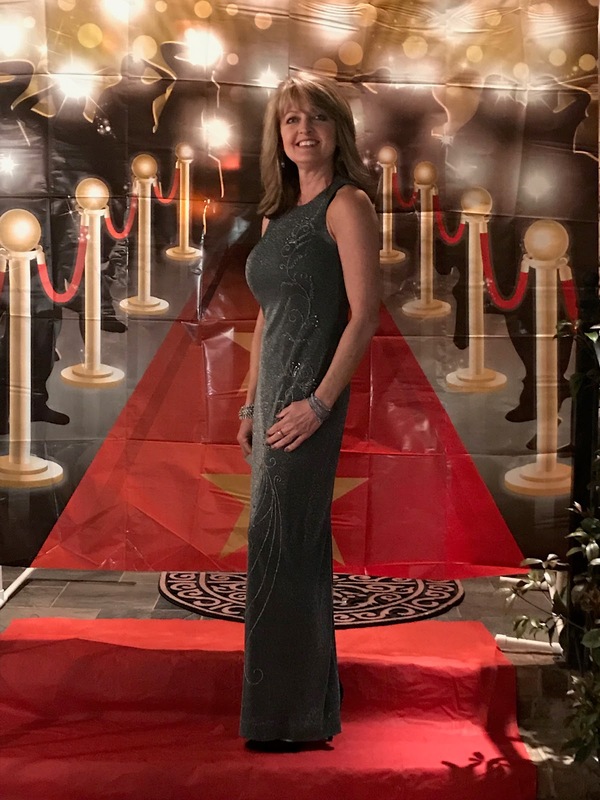 • Go all out and rope off your red carpet with a velvet rope stanchion set (found here). 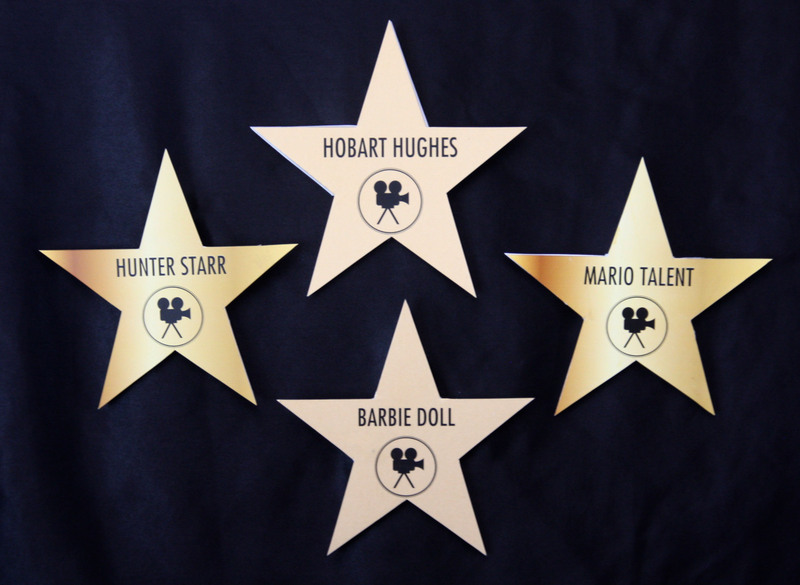 • You can also order stick on stars here (pictured below). 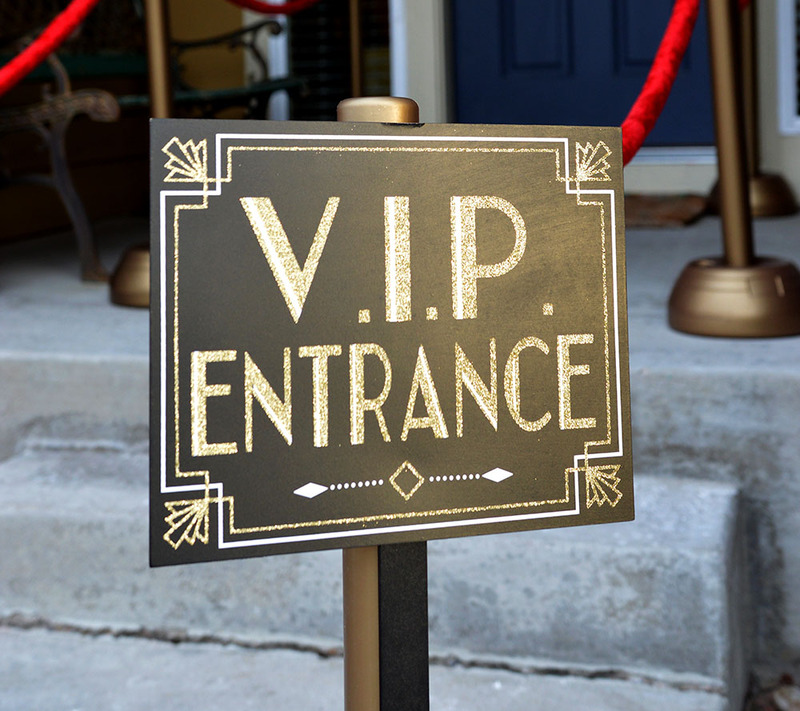 • Mark the entrance using signs indicating “V.I.P. Entrance” and “Stars Only” (included in packet). 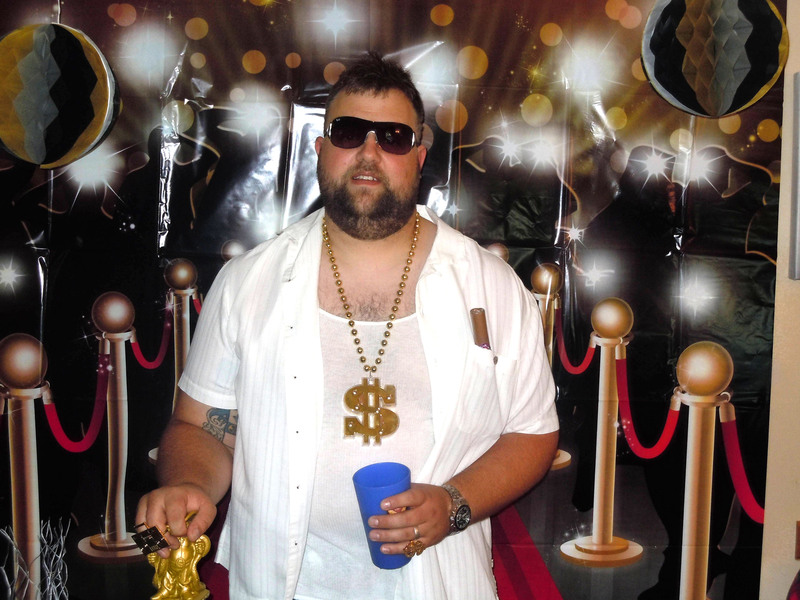 • Set up a strobe light by the entrance to simulate the paparazzi taking pictures! Or enlist a few friends to be the paparazzi for the night. Ask them to snap photos as guests enter the front door. • If hosting a party at night, consider a few spotlights on your home (found inexpensively at a local hardware store). 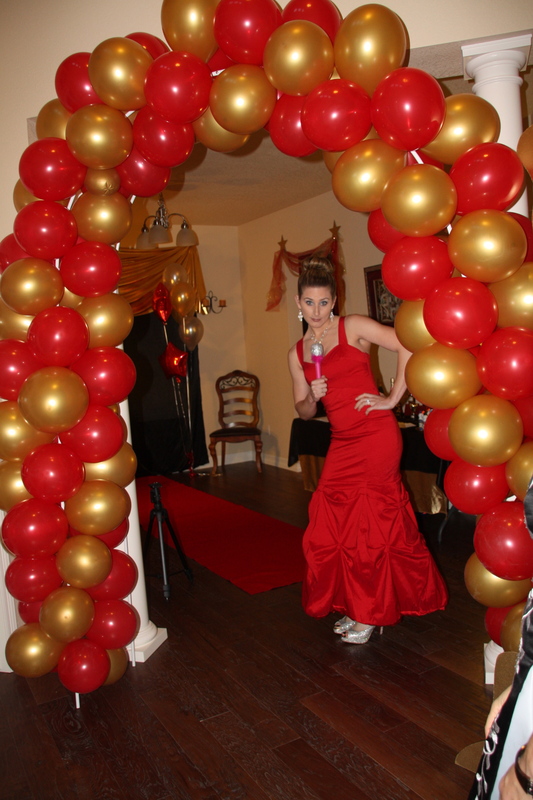 • Consider a balloon arch to have your stars walkthrough on the way to the red carpet and/or the party! 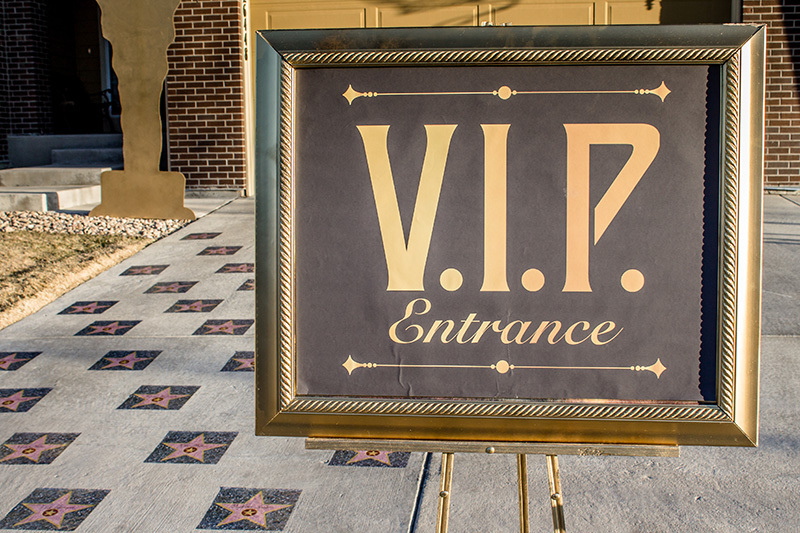 • Have a friend (potentially MC Award or Vanity Affair) interview your guests as they walk in and ask them about their character, what designer they are wearing, etc. etc. 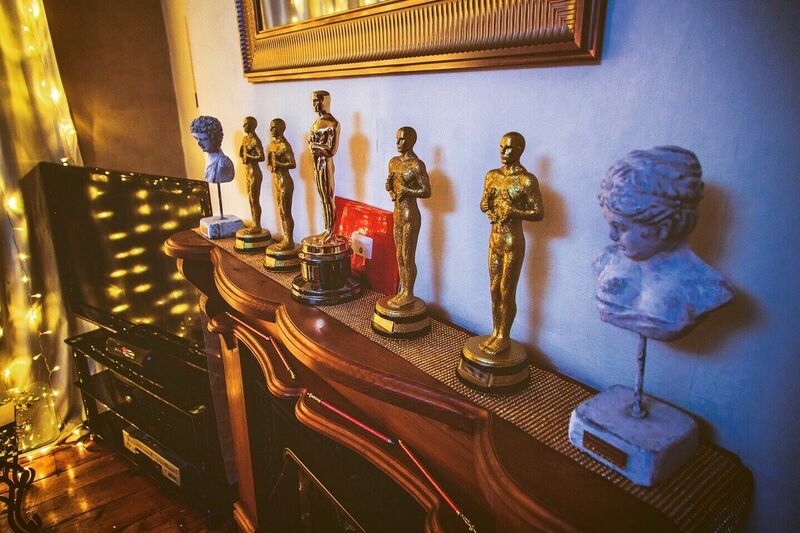 • Oscars, Oscars, everywhere! Lifesize or not. 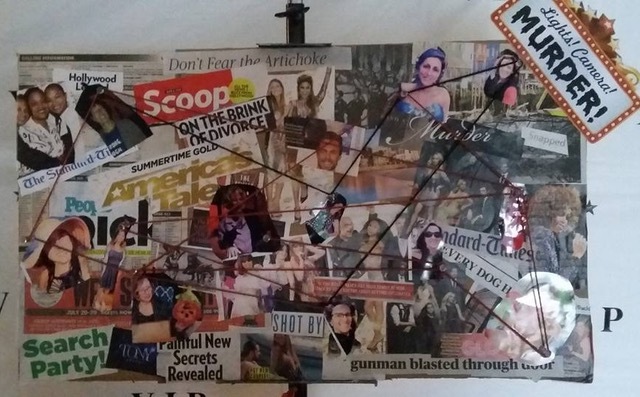 • Create a Hollywood whodunnit board filled with tabloids and some suspects of your own! 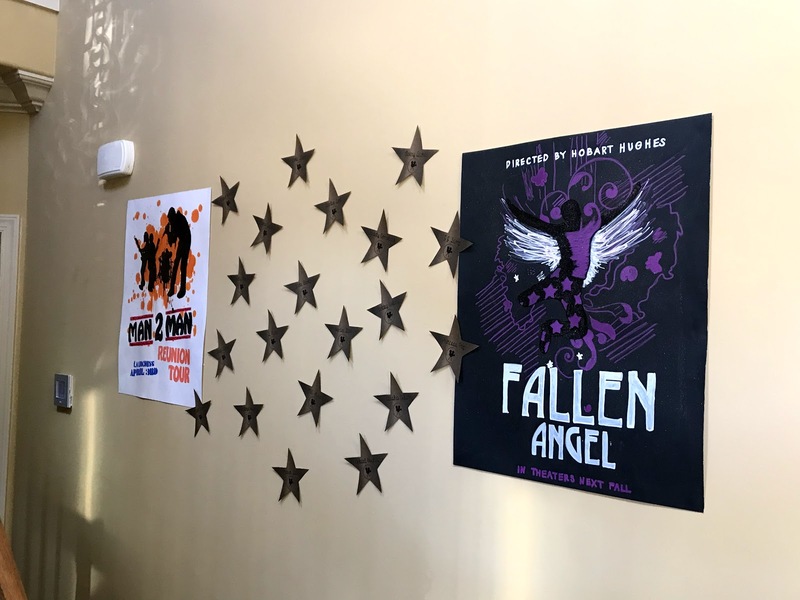 • Hang “Fallen Angel” movie posters and an “M2M Reunion Tour” poster around your party space (designs included in packet). Mark the bathroom as the “Dressing Room” – special sign included in the packet. 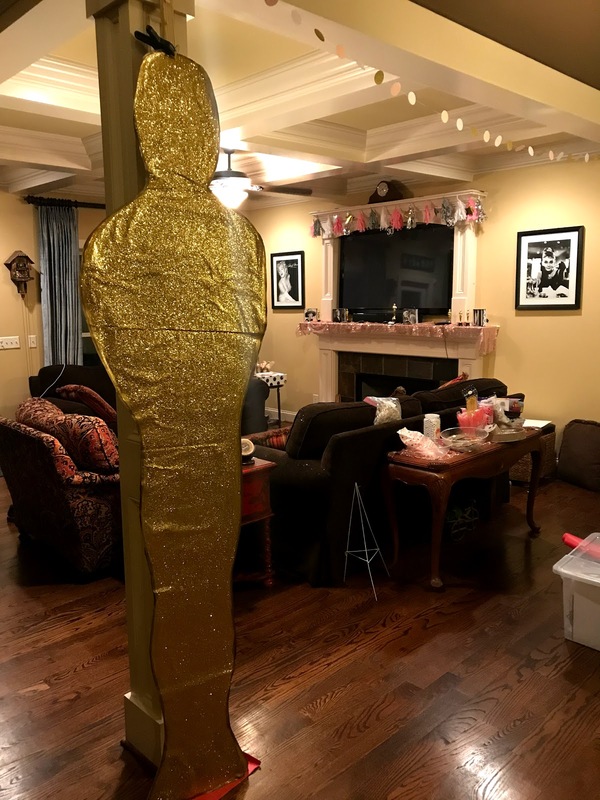 • Use life-sized cutouts or 8×10 photos of Hollywood legends around your party rooms to make guests feel they are truly in Tinsel Town. 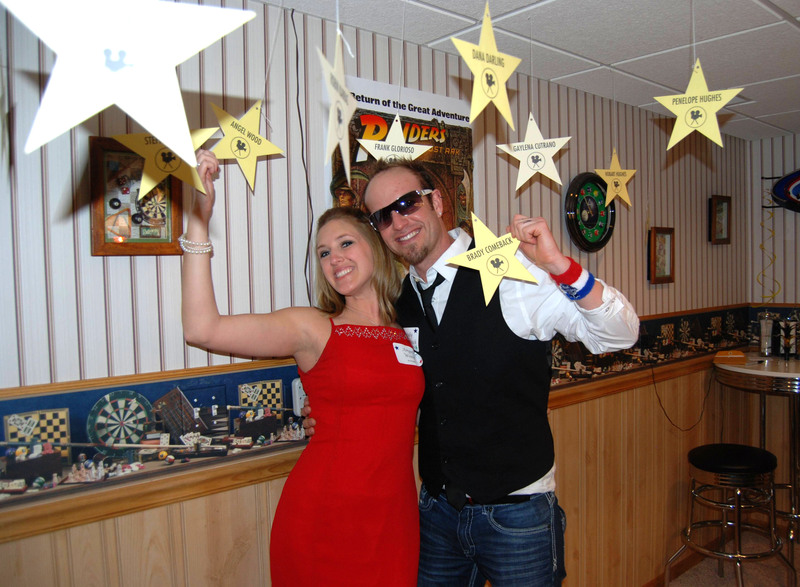 • Use the star template in the packet to create personalized stars and hang around party space. • Cut out stars of various sizes and spray paint them gold and silver and hang from the ceiling with fishing line or clear thread. • Adorn the party with gold and silver balloons. • Have classic movies and/or Oscar-winning movies playing silently on t.v. or projected on a wall. 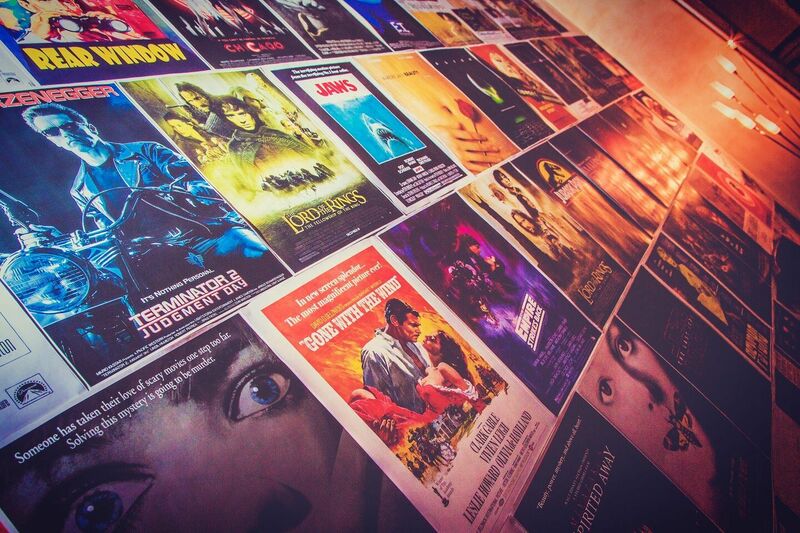 Hang old movie posters (in particular, of Oscar winners) around the party space. 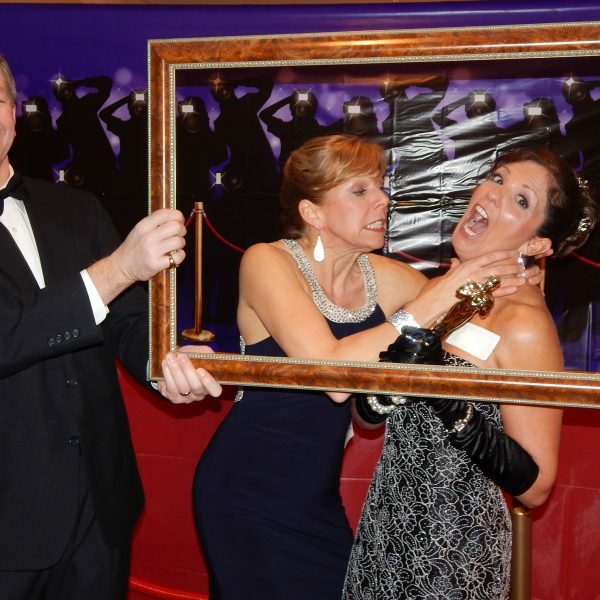 You can find a list of the “best Pictures” from over the years here. • Download the current Oscar posters here. 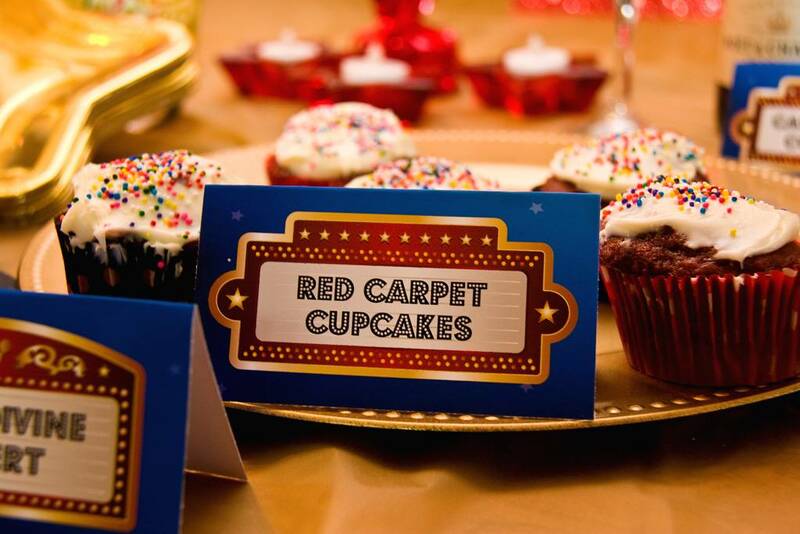 Use scene setters (inexpensive rolls of printed vinyl) to create the perfect background for your party. You can find them in many designs that would match your theme here. 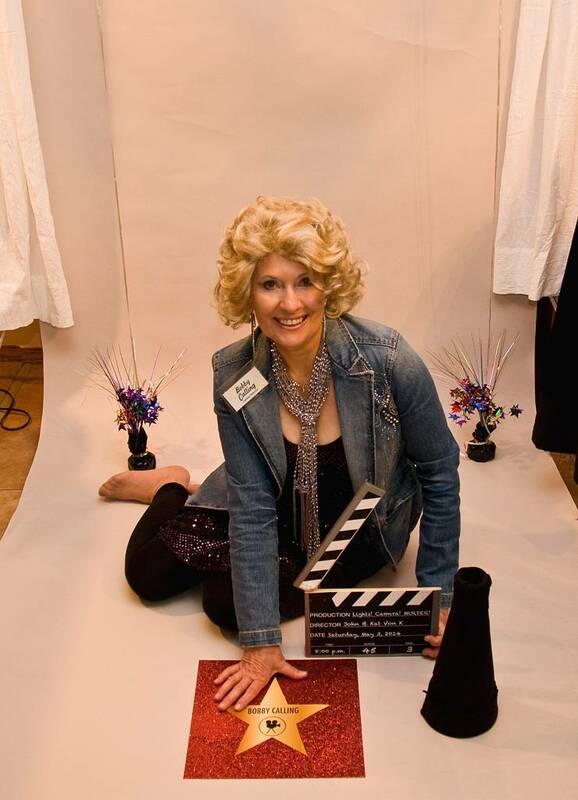 • Be creative with props like the director’s chair, cameras, and lights. 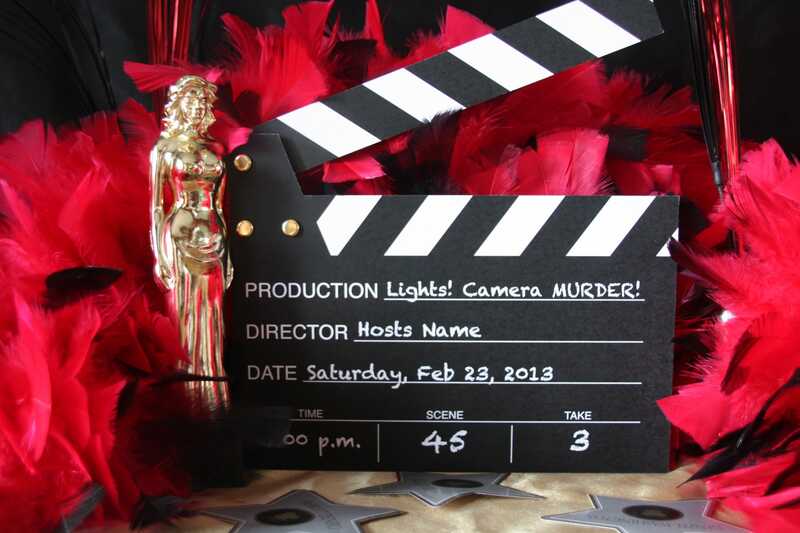 Create your own clapboard with instructions and designs included in the packet. 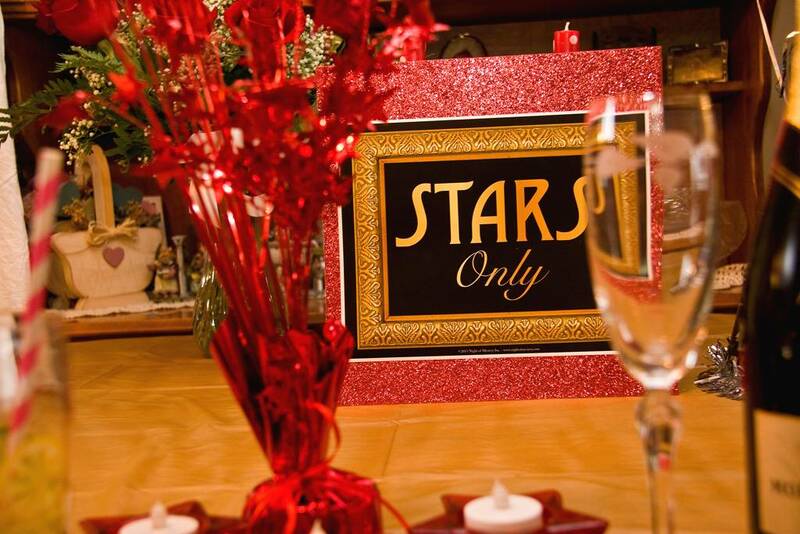 • Sprinkle stars in all sizes over everything: entryways, tables, ceilings, walls, or tucked inside invitations. • Label a few well-chosen items from around your house like famous film props on display. 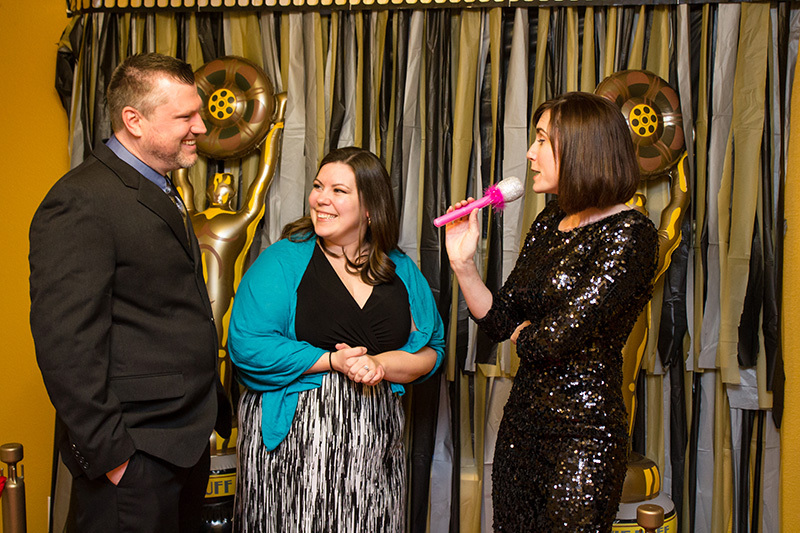 • The most popular backdrop for this mystery has GOT to be the red carpet! 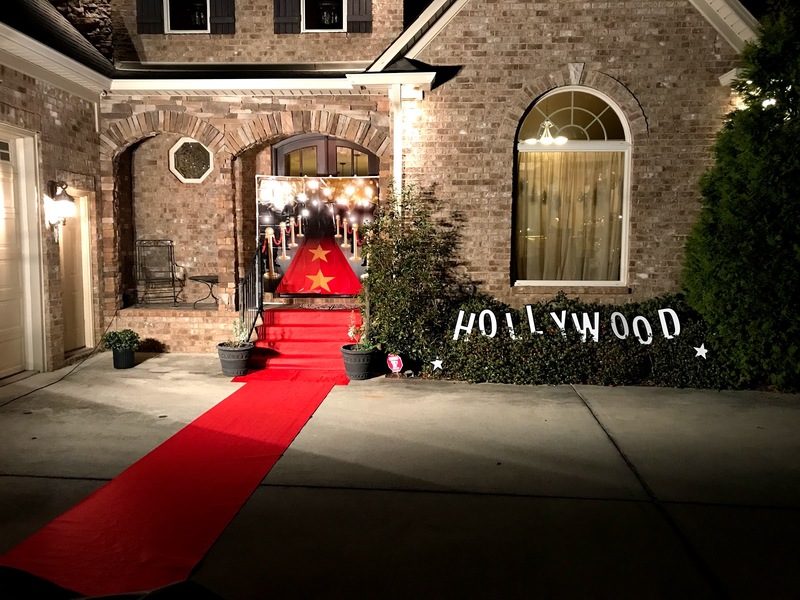 • Use props like a red carpet, tiaras, boas, lavish chairs, anything you can think of, to create a staged area for pictures. A-List of what to serve (and how to serve it) for your A-Listers!!! • Dress up your food and drinks with bowties. • Find a tuxedo strawberry recipe here. • Garnish your drinks with starfruit. • Create your own cookie awards. Recipe and directions here. 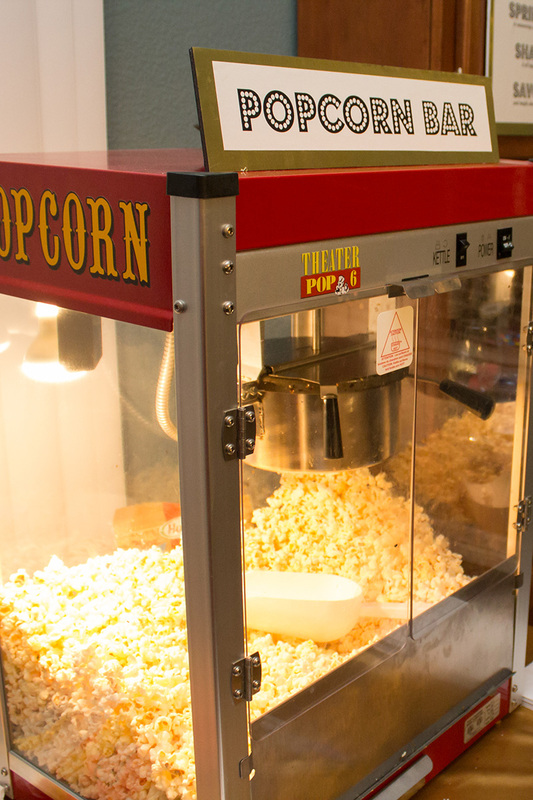 • Rent a popcorn machine and generate movie-theatre aromas and buckets full of buttery popped popcorn. You may want to consider some traditional fare spiced up with a few twists! Popcorn: you can add flavor to microwave popcorn by making a spice mixture such as this one. Pretzels: Buy frozen pretzels from the grocery store and serve with elegant sauces: plum, honey-mustard, gourmet cheese, etc. Hot dogs: serve sausages of a higher variety. Pizza: make it gourmet with vegetable toppings and some oil and vinegar on the top. Always a good idea when hosting! 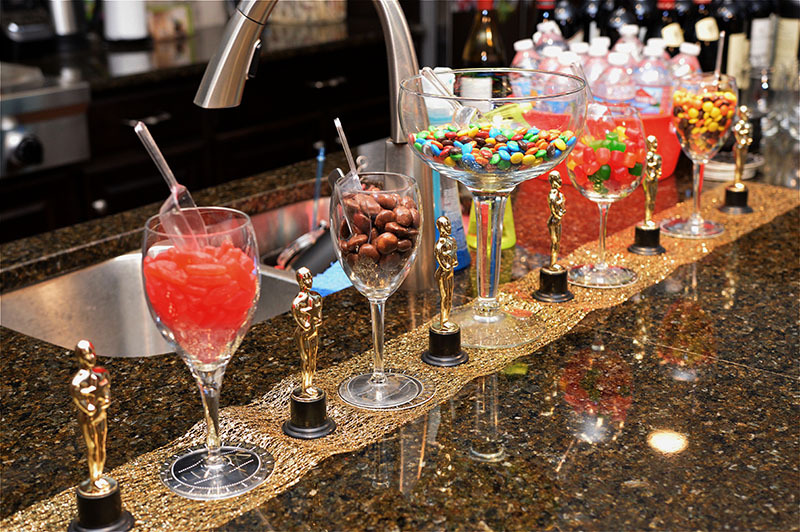 Have a buffet of elegant hors d’oevres by creating or asking everyone to bring an Oscar-worthy appetizer. 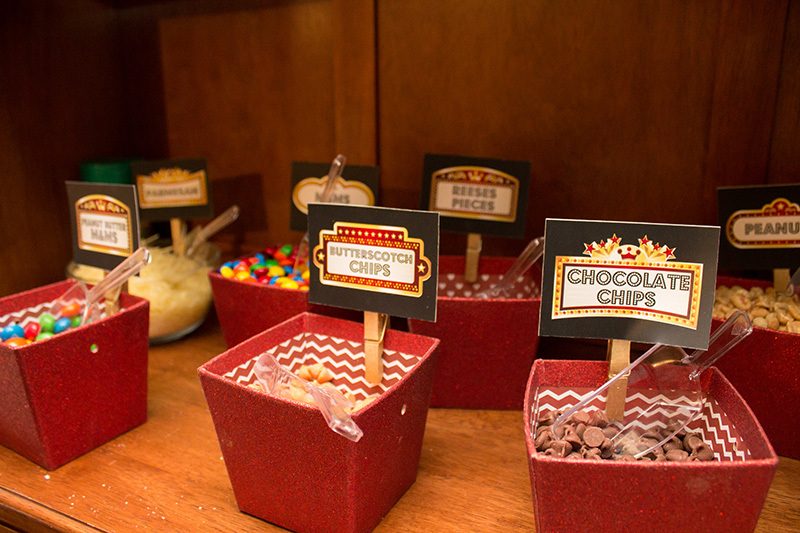 Consider a “Popcorn Bar” where your guests add their own toppings to their popcorn. Set up a “Candy Bar” for dessert. Have a number of your favorite movie candies from licorice to milk duds to Mike & Ikes. 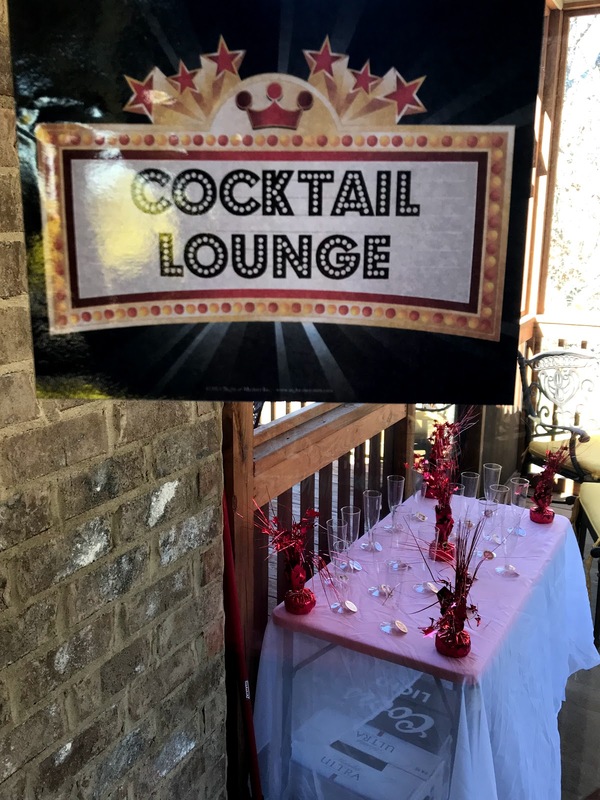 A fun and easy way to “treat” your guests and keep within your theme! 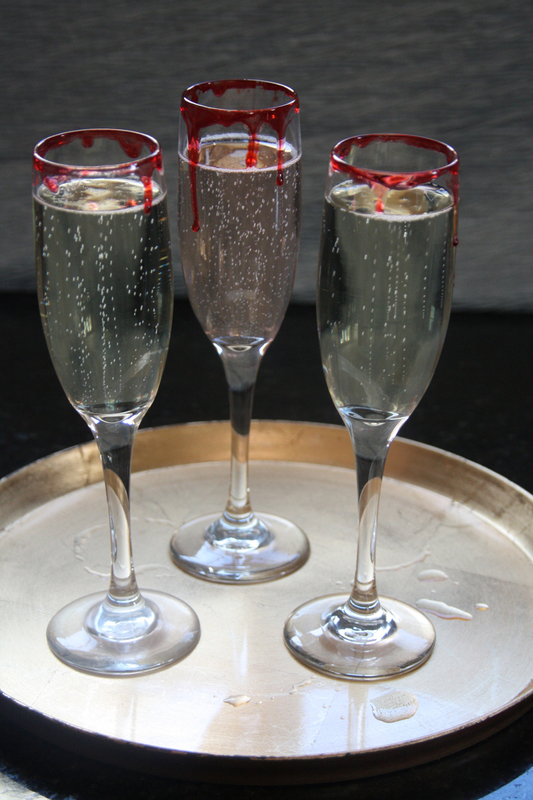 Upon arrival, offer champagne or other bubbly drinks for your guests to toast to their accolades. 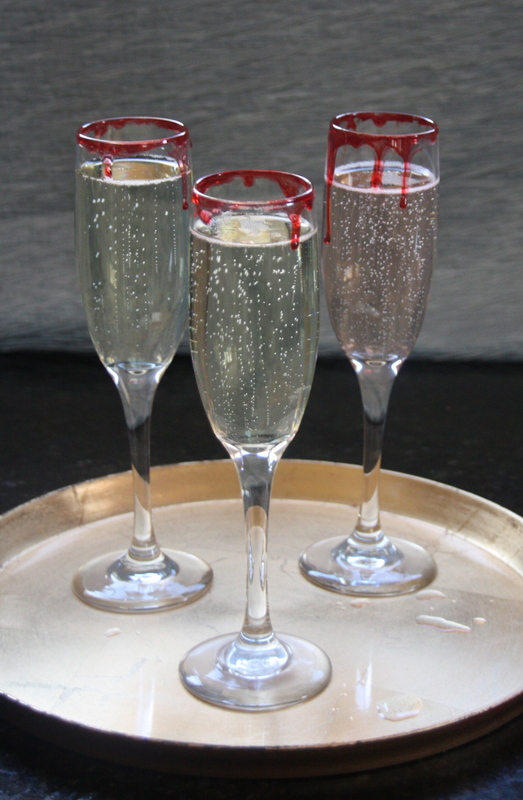 – You can find a champagne fountain online rather inexpensively. – Coat the rim of your glasses with red-dyed corn syrup and let it dry ahead of time, to give it a dripping blood effect. Create your own cocktails with movie titles in the names. Here is a link with 19 movie-named drink recipe options for you. 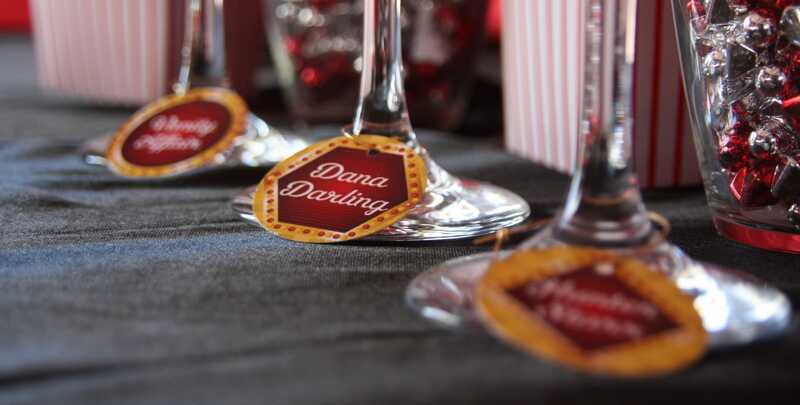 Make wine charms for your guest’s champagne/wine glasses. Template included with the packet. Stream music from the internet — If you want current music, but don’t want to pay for it, set up to stream music from the internet for your party. You can do so by utilizing the radio function or podcasts in iTunes! If you don’t have iTunes already on your computer, you can download it here. For Free Music– Visit your local library for a number of compilations. 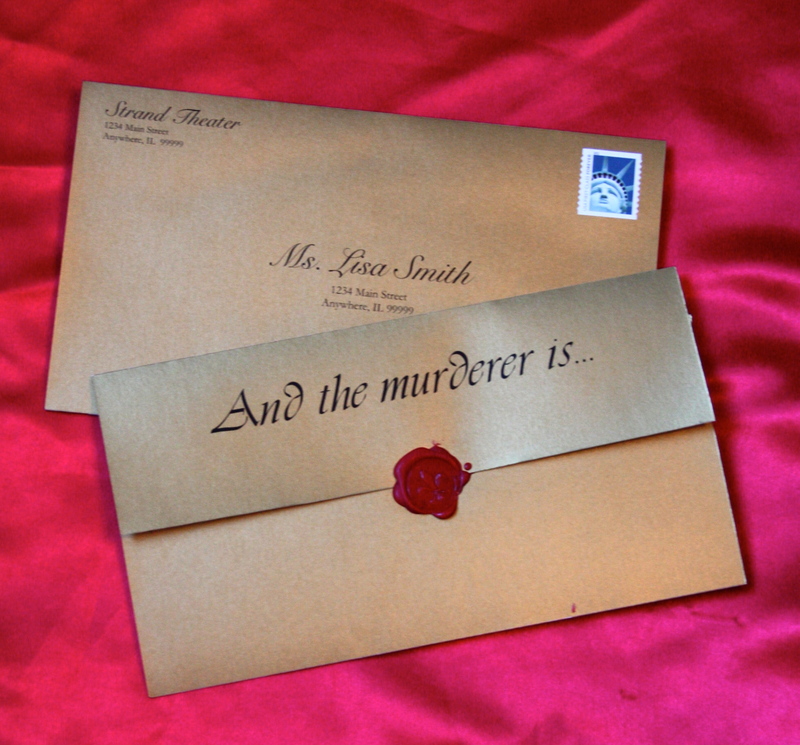 With this mystery theme, you have a unique opportunity to send specially themed invitations to help create even more excitement for your party! Along with the mystery, we have included templated, an editable design that allows you to enter in your guest’s name and addresses and print out on cardstock (gold suggested) and send through the mail. This is one way to be certain your guests are excited for what’s inside… and for what’s to come at the party! For even more party planning ideas, check out our Lights! Camera! MURDER! Pinterest Board here. HOW TO MAKE YOUR OWN CLAPBOARD! All of the information regarding how to run your Lights! Camera! MURDER! party can be found online at Night of Mystery. We highly suggest that you take time to look over our website and download the Lights! Camera! MURDER! preview file. Upon reading the introduction file, it will give you a better understanding about how the parties are run and what to expect once you purchase a full mystery file. Check out our Lights! Camera! MURDER! Pinterest Board! For even more party planning ideas, check out our Lights! Camera! MURDER! Pinterest Board here. It is s filled with ideas for recipes, costumes, decorations, etc. for the perfect Lights! Camera! MURDER! party! - HOW TO MAKE YOUR OWN CLAPBOARD! 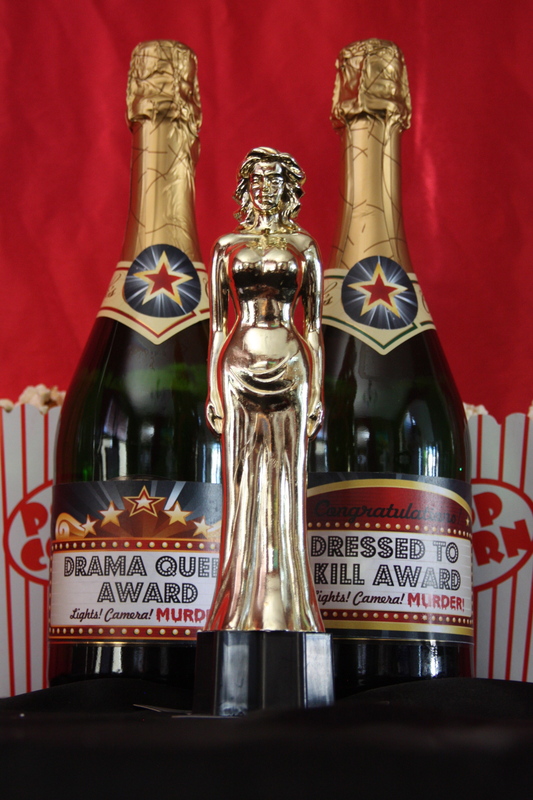 - WINE CHARMS - CHAMPAGNE BOTTLE LABEL AWARDS And more! 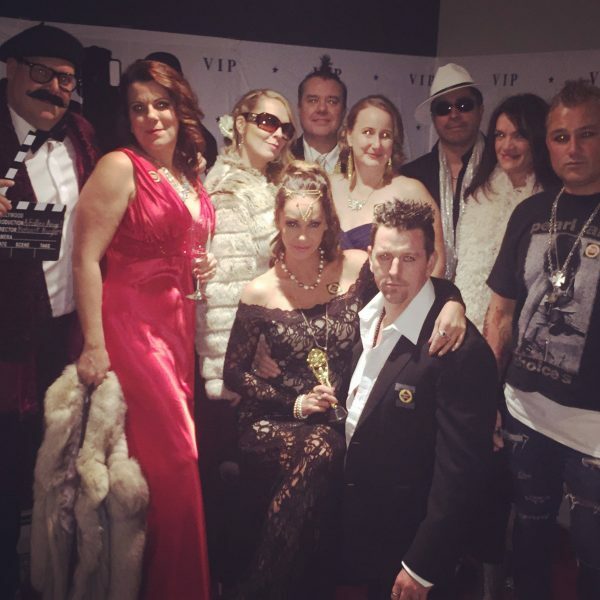 This was the second murder mystery I had hosted for my friends and due to the success of the first one we went from 12 people at the first one to 20 at this one. 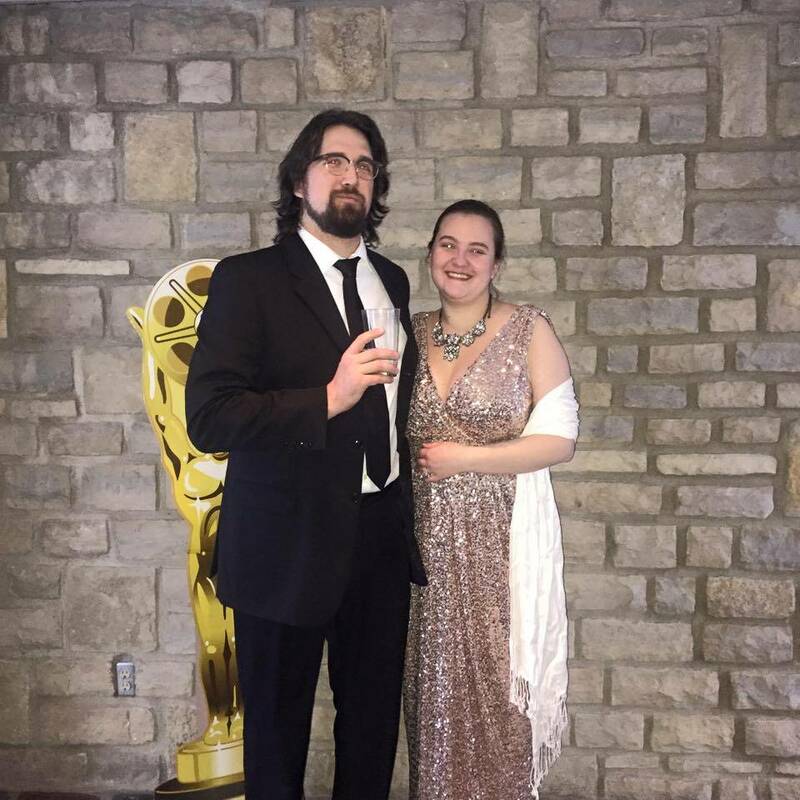 The decorations included with the kit and the stuff I found at party stores to go along with it just made this night so magical, as well as everyone dressing up all fancy and playing their characters with such dramatic gusto. I would have to say this one was a major success and I am already being asked when the next one will be, so it looks like this is now our "thing". 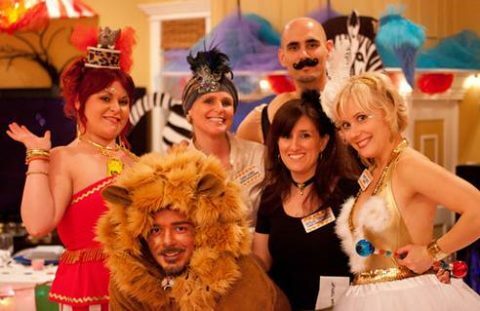 Thank you, Night of Mystery, for making such great products that bring everyone together and ensure a great evening no matter what the theme is. The game was so fun and well scripted that everyone easily fell into character. 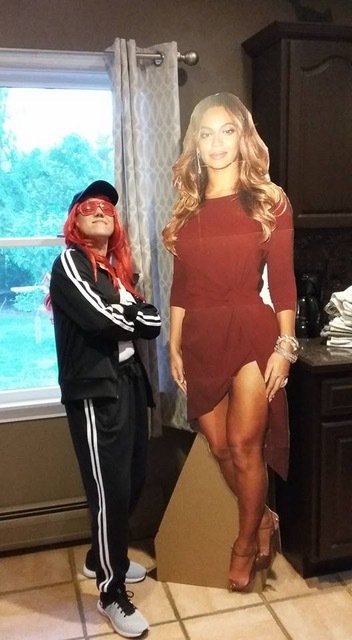 It's exciting to pretend you're someone else for a night....four months later and my friends are still asking me to host another mystery party! I turned 30 this past weekend and decided that I wanted to do something different from the usual NYC “Dirty 30” club party. 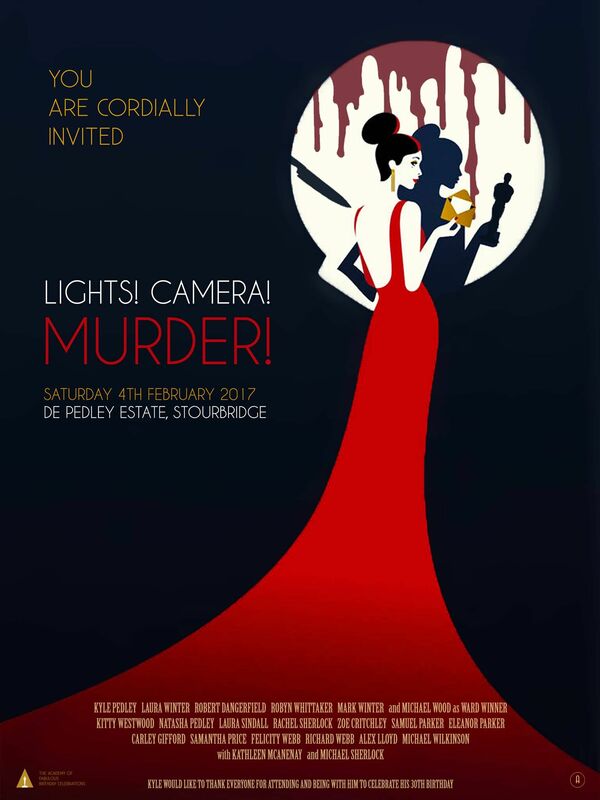 Lights, Camera, Murder! was the perfect mystery choice for this occasion. 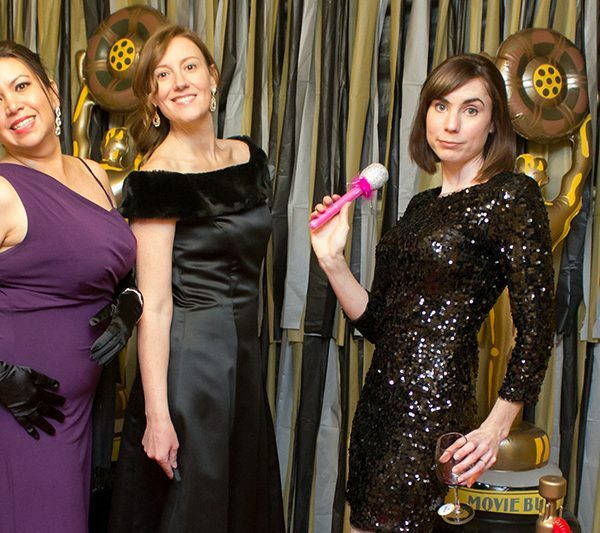 It’s been days since my party and my friends and I are still raving about how much fun we had. The game was so fun and well scripted that everyone easily fell into character. 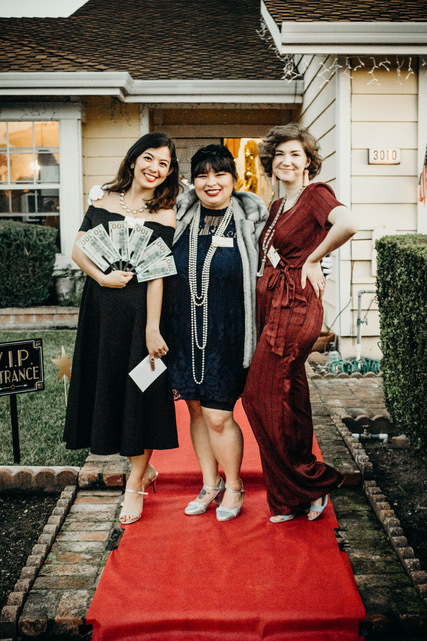 It's exciting to pretend you're someone else for a night....four months later and my friends are still asking me to host another mystery party!What I loved most is that the party truly involved everyone. Even the people in the “extra” roles had things to do and thoroughly enjoyed themselves. 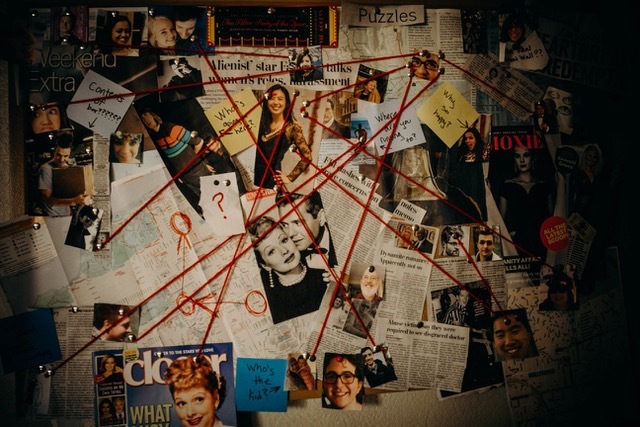 Once the murder occurred (conveniently during my blowing out the candles of my cake) everyone gathered to hear the investigator and no sooner than she finished did they jump back to their objectives of solving the mystery. Two guests correctly guessed the murderer while the rest of us had no clue. 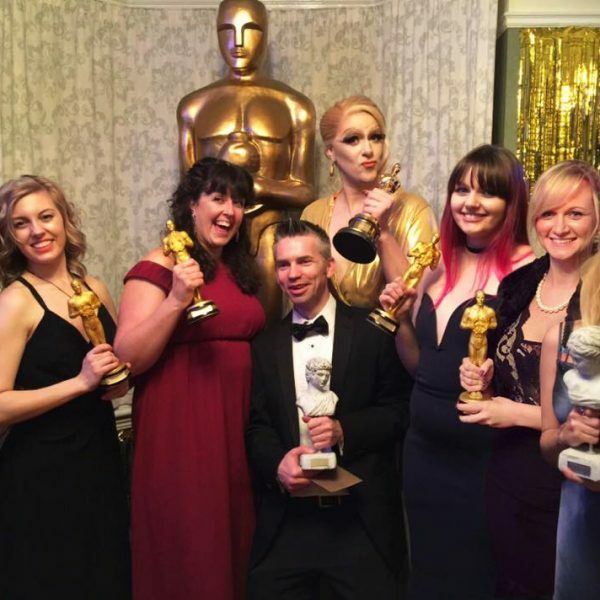 I handed out the awards for best performance and costumes of which the acceptance were followed by speeches “thanking the academy” and general partying. This was truly a memorable birthday celebration and I’m so happy I chose Night of Mystery for my kit. Thank you so much for offering all of these great murder mystery packets. 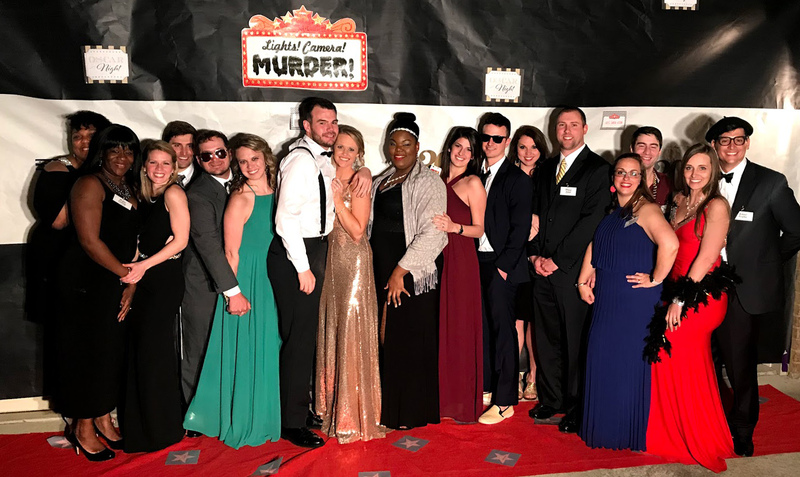 Last weekend we hosted a murder mystery dinner for Lights! Camera! MURDER! and had a great time! 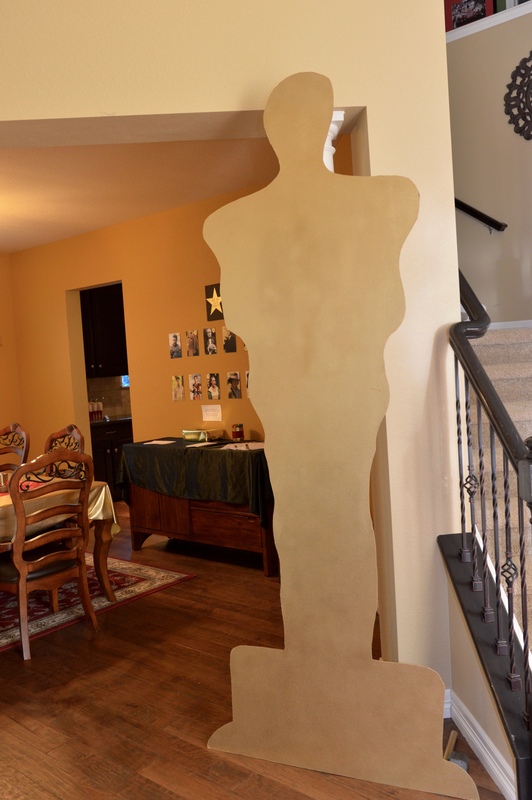 We had 32 guests, a wall set up like a backdrop to the Academy Awards with a red carpet in front, hollywood stars in our entryway and posters of celebrities around the house. Our group did such a great job dressing up. 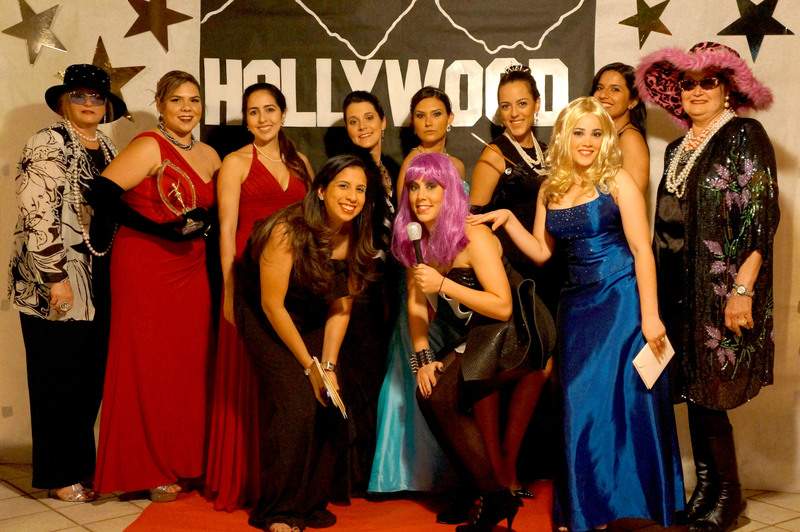 Some of the best costume awards went to J.J. Scoop, Barbie Doll, Angel Wood and Brady Comeback. 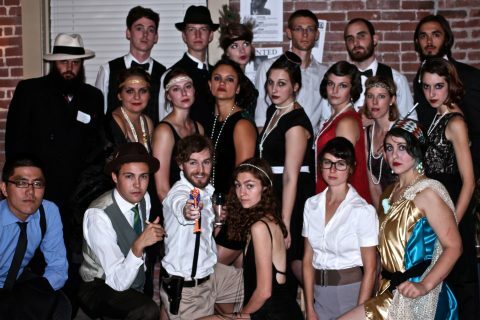 The murder mystery itself was so much fun, and it was amazing to see how much everybody really got into character! I was actually surprised at how some of the guests who I wasn't expecting to do much acting-wise really got stuck in. Having friends come from as far as flying in from Ireland, and having never done a murder mystery with so many people (we ended up with 24 in total) I was naturally a bit reticent beforehand as to how smoothly the night would run, but I have to say, it went perfectly! Seeing people, including some who have never met before, engaged, in character, hurling insults or sharing jokes/secrets/bribes/scandal made for an hilarious, joyous and unforgettable atmosphere, all set to a pre-arranged soundtrack of movie themes and suitably ominous murder mystery music for the more dramatic moments.